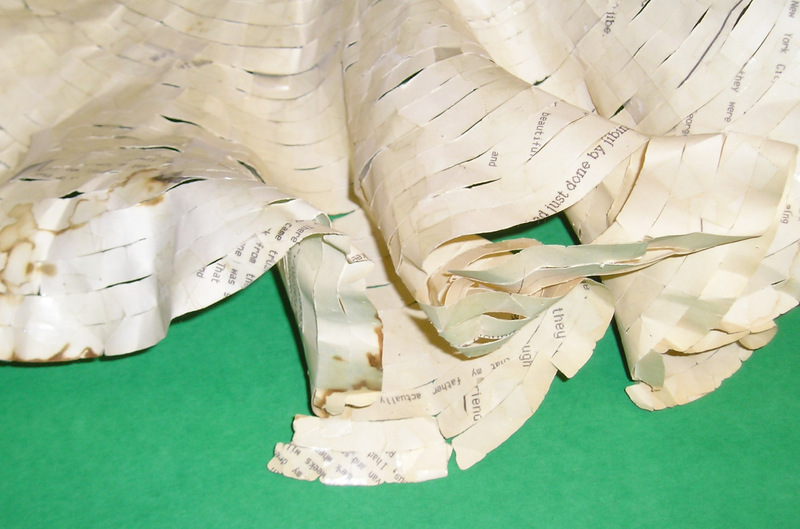 The first paper model was made in 1868 by Italian mathematician Eugenio Beltrami. (see more about it in my blog). It was 1966/67 while a college student when William Thurston independently came up with an idea how to make a paper model of hyperbolic plane that does not require any formulas - it can be done just by gluing together anuli. This is a picture of a paper model I saw in 1997 workshop led by Prof Henderson, who learned Thurston's idea in late 1970's. 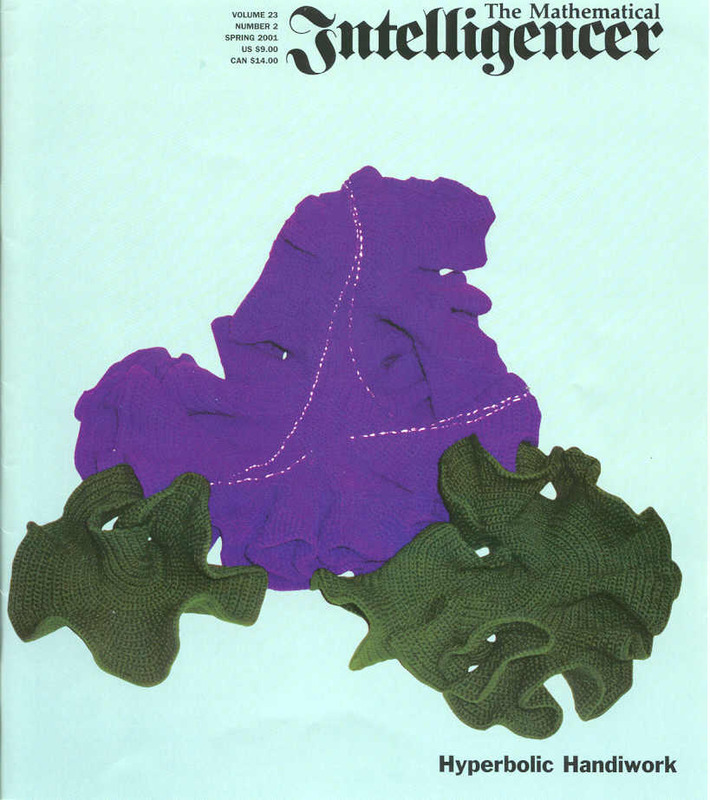 Crocheting was again a topic in Mathematical Intelligencer (Vol. 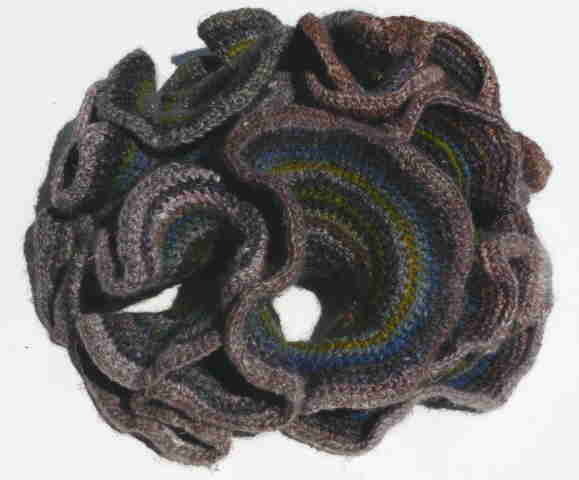 26, No.4, Fall 2004, p. 25-37), when it published a paper of Hinke Osinga and Bernd Krauskopf "Crocheting the Lorentz Manifold". 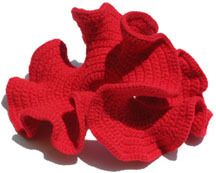 In December 2001 Michael Brooks published in New Scientist an article about knitted and crocheted mathematical objects, including my crocheted hyperbolic planes. This was noticed by Margaret Wertheim, the founder of The Institute For Figuring, who wrote me the first e-mail on September 1, 2003. That was the beginning of our collaboration. In May 2004, David Henderson and I were invited by The IFF to give a lecture in Los Angeles. That led to the interview with Margaret Wertheim, published in Cabinet magazine with three authors, since we all three worked together quite a lot on this publication to get everything correct. On The IFF page only one author is mentioned and soon after TheIFF self published a booklet "A Field Guide to Hyperbolic Space", where most of the text is based on our lecture and the interview. This booklet is promoted in Springer publication which is a violation of academic integrity - in fig.7, 8, and 10 credits are given only to The IFF but those are models I designed and crocheted; the explanation of the hyperbolic geometry is mostly taken from our first joint publication but the author of the publication, Mick Wyckoff, did not give any references to original sources. In 2005, I received the first invitation from Binnie Fry to participate in fiber art show "Not the Knitting You Know" . 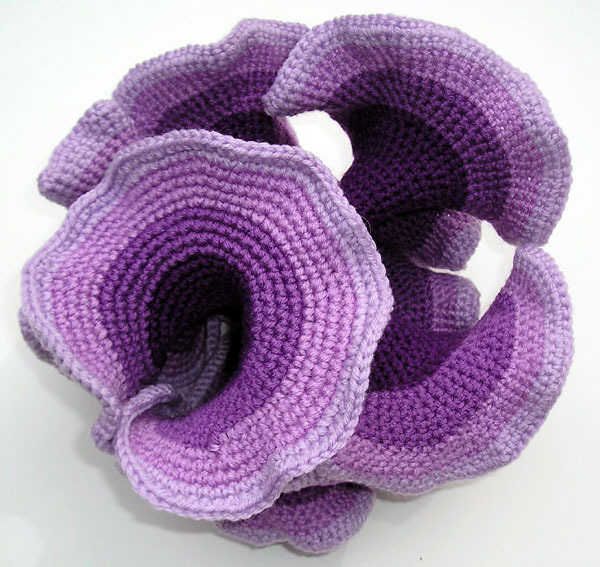 Later the same year, The IFF with Machine Project organized the exhibition "Crocheting the Hyperbolic Plane" in Los Angeles. 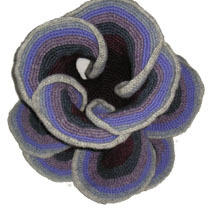 In October 2005 - June 2006, The IFF Cookie Jar Fund supported my project "Visualizing hyperbolic plane through crochet", which was the beginning of my book project. My project was one of many more projects in The IFF supported that year by anonymous donor. In January 2006, The IFF commissioned me to make a model similar the one I had made for my first fiber art exhibit in Washington, D.C. 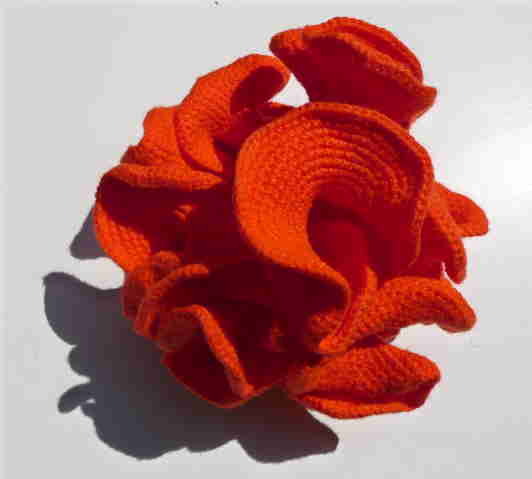 It inspired another crocheter Spring Paige to crochet around it smaller hyperbolic planes and the first crocheted coral in IFF was born. 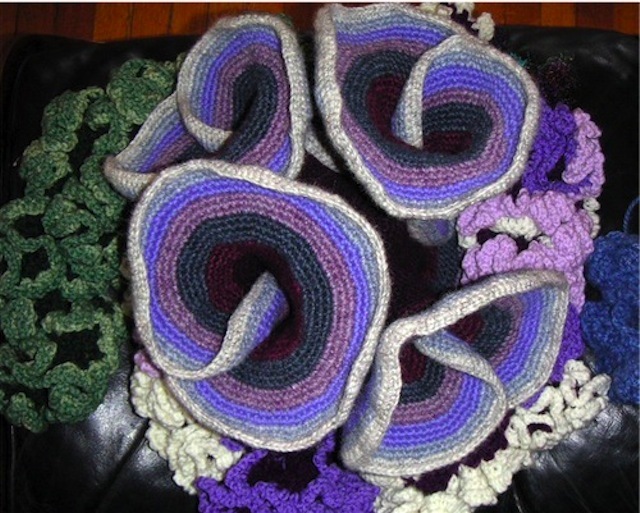 In April 2006 The IFF announced that they have started "Hyperbolic Crochet Coral Reef" project, involving hundreds of crafters and some very fine fiber artists. 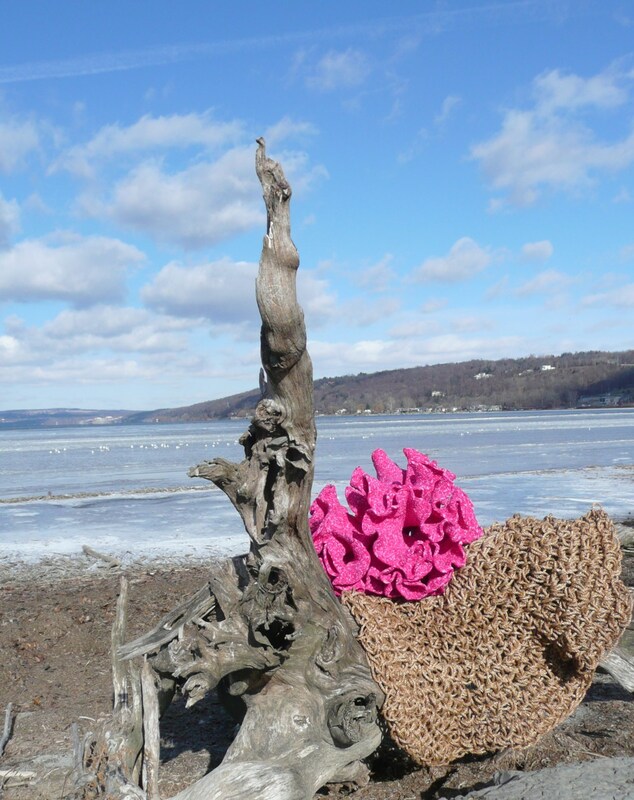 Hyperbolic Crochet Coral Reef is designed, curated and parts of it done by co-directors of The IFF Margaret and Christine Wertheim. 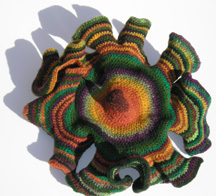 For more recent updates on my work please visit my blog "Hyperbolic Crochet"